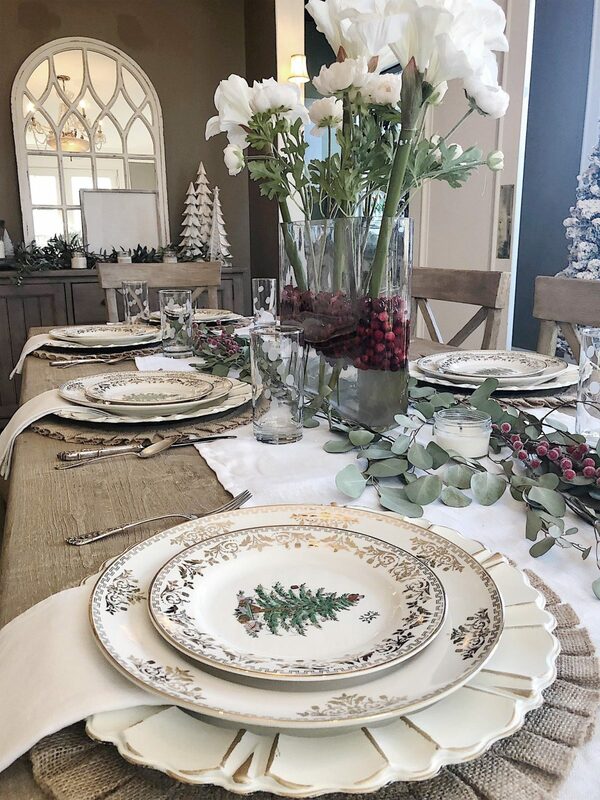 I am so happy to be partnering with Portmeirion/Spode to create this beautiful table for this blog post. 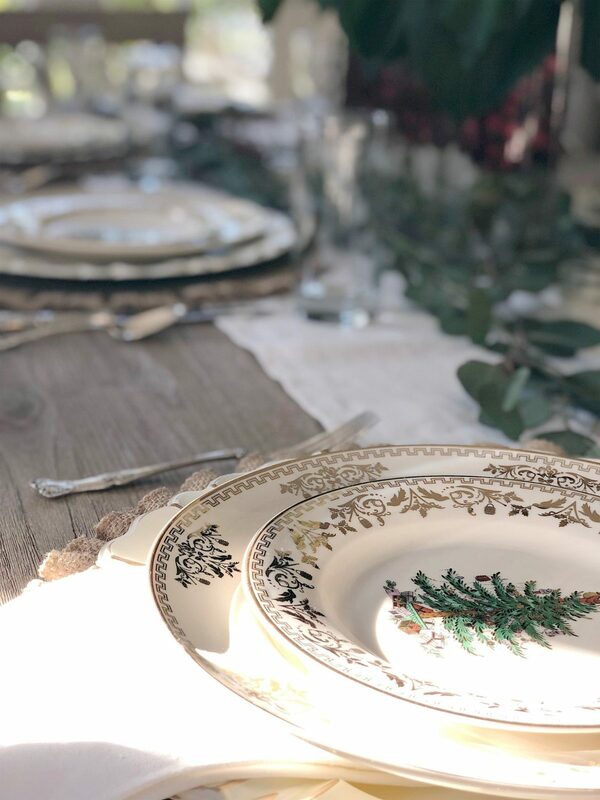 So many of my girlfriends use their Spode Christmas Tree plates for Christmas dinner. I have collected a few Spode Christmas Tree serving pieces over the years. But this year I was thrilled to discover the Spode Christmas Tree Gold Collection. 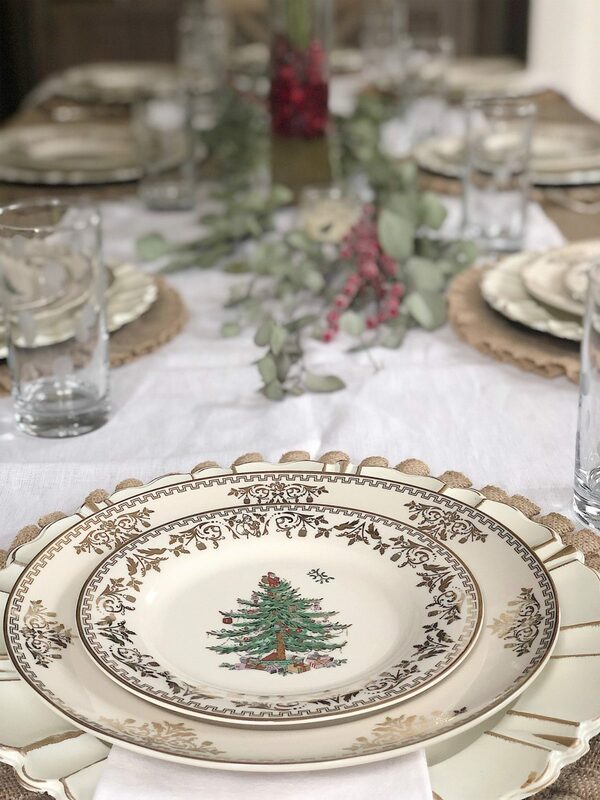 I love that the Spode Christmas Tree serving pieces I have collected pair so perfectly with my new Spode Christmas Tree Gold Collection. 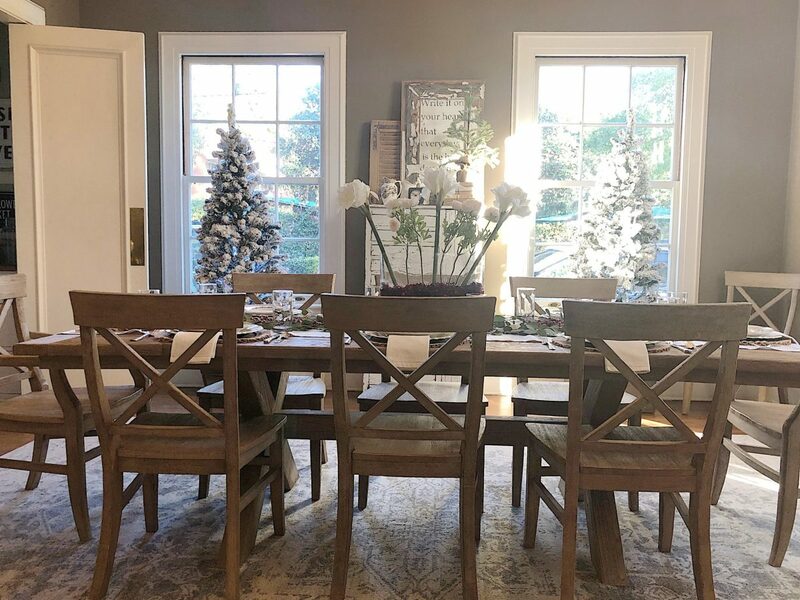 I had so much fun setting a table for the holidays and I love how this turned out. I used a linen runner down the center of the table and added burlap placemats. 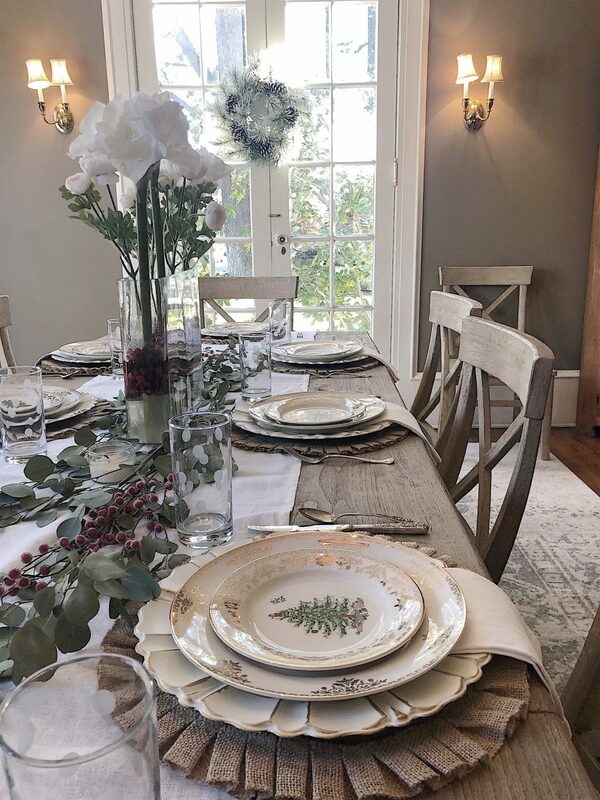 Then I pulled out my off-white and gold chargers and placed them underneath the Spode Christmas Tree Gold Collection Dinner and Salad plates. Aren’t these plates just elegant and wonderful? 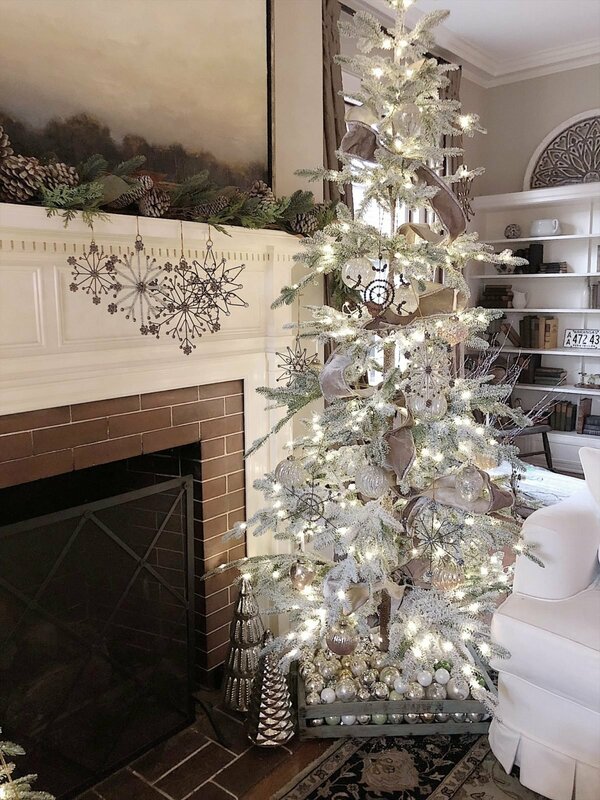 I thought you might enjoy learning how the Spode Christmas Tree design was created and topped with a Santa instead of a star. In May of 1938, Mr. Thompson, the sole agent for Spode in the US, wanted a new design for the Christmas season, different from the many holly designs found in old Spode pattern books. 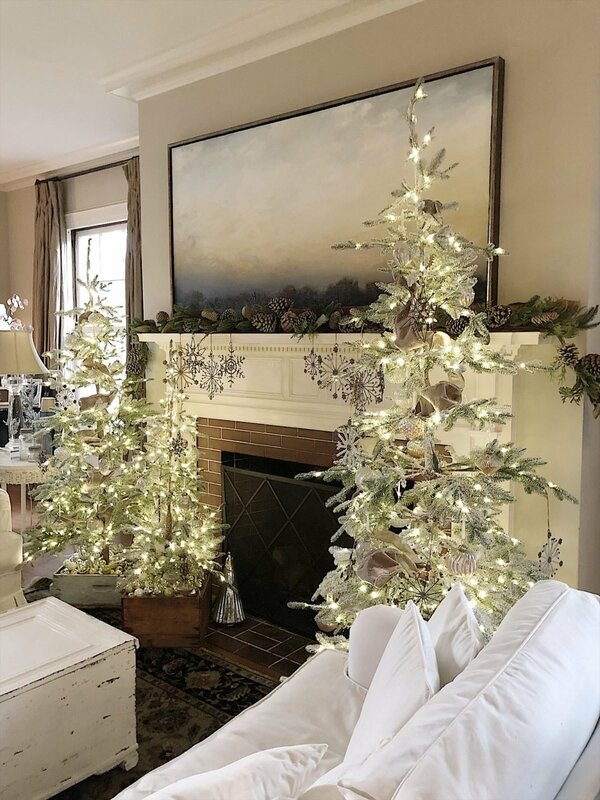 One of the designers, Mr. Holdway (who later became Design Director) created a design featuring a Christmas tree profusely decorated with gifts, baubles and tinsels on the fronds. He was then advised that in America, Christmas gifts are wrapped and tied with ribbon and placed at the foot of the tree. The design was amended, improving the balance of the design. Factory legend suggests that the designer had no idea what they put at the top of the tree (in the US) which is why the Spode Christmas Tree has a Santa. I still can’t believe Spode Christmas Tree has been around since the 1930’s. To finish my table, I added some fresh eucalyptus to the table and a fresh center piece. I love white Amaryllis and I had fun adding cranberries to the water! The cranberries not only look fabulous but they also provide support for the flowers. 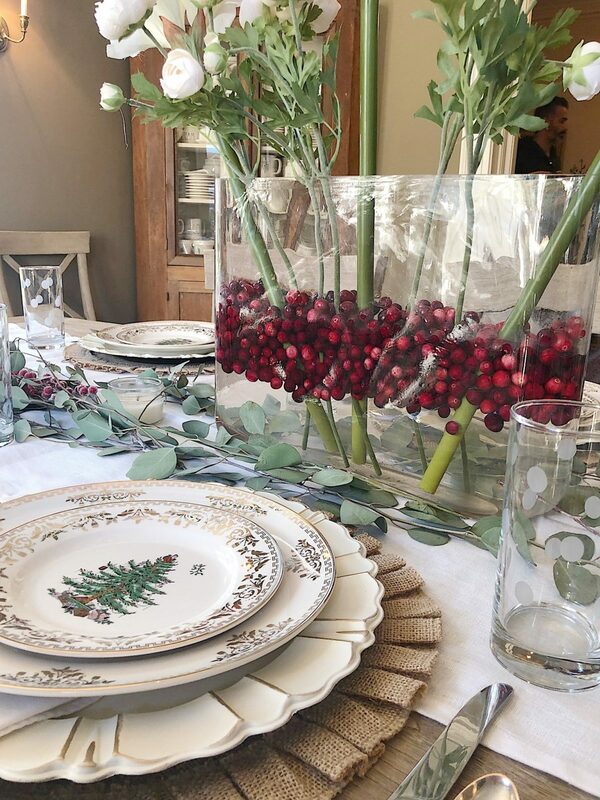 I also added some beaded cranberry stems to the table for a pop of color. This table setting will definitely be here for my Christmas Dinner. 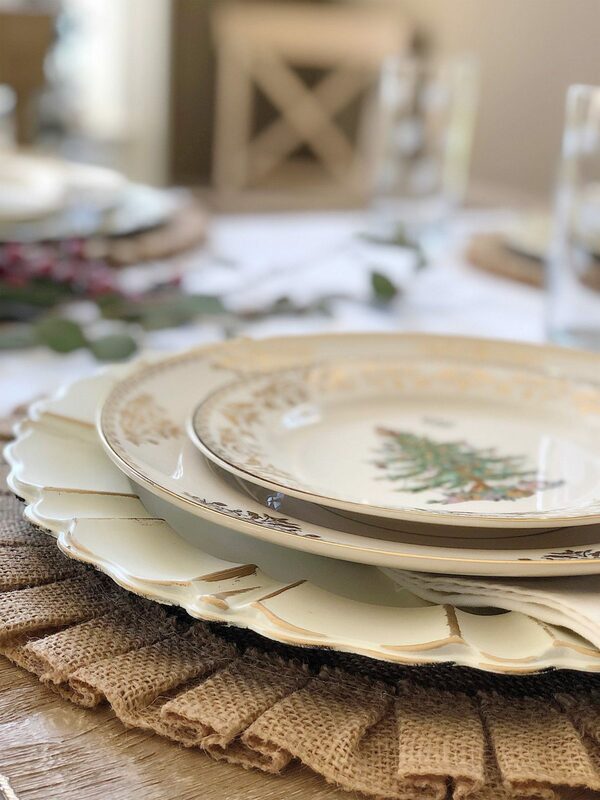 It’s not too late to add Spode Christmas Tree Gold Collection to your holiday table. You will use them forever! Every Christmas morning, I make my mom’s Overnight Sausage Casserole. It’s really delicious and I always make it the night before. I love knowing that each of my siblings is enjoying the exact same breakfast on Christmas morning with their families! Do you have any special tradition to unwrapping your gifts? My husband started a tradition in our family so we always open the stockings one gift at a time, youngest to oldest. Then we usually refill our coffee and start opening gifts, one at a time, oldest to youngest. I love this tradition! We get to see every one of the gifts and we enjoy a much longer Christmas morning. The last tradition I would love to share is that my husband Dave reads ‘Twas the Night Before Christmas to our boys every Christmas Eve. This tradition started when the boys were so little! Twenty some years later and he still reads it every Christmas Eve. Last year when we were headed to London for Christmas, I packed the book in my suitcase before we left. It was such a fun surprise to carry on the tradition, no matter where we celebrated Christmas. 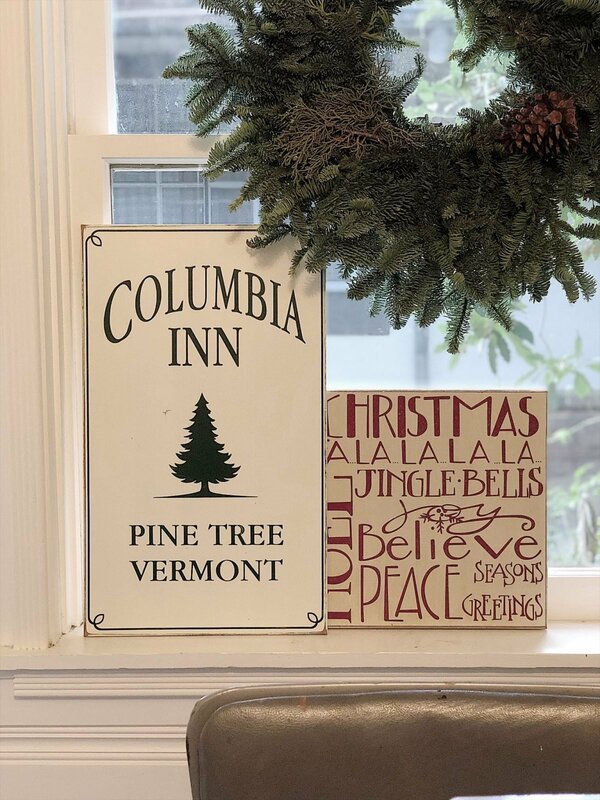 Christmas traditions are one of my favorite parts of the holidays. I encourage you all to continue your own childhood holiday traditions. Don’t be shy about starting new ones too! I would be thrilled if you chose to share any of our traditions with your families. 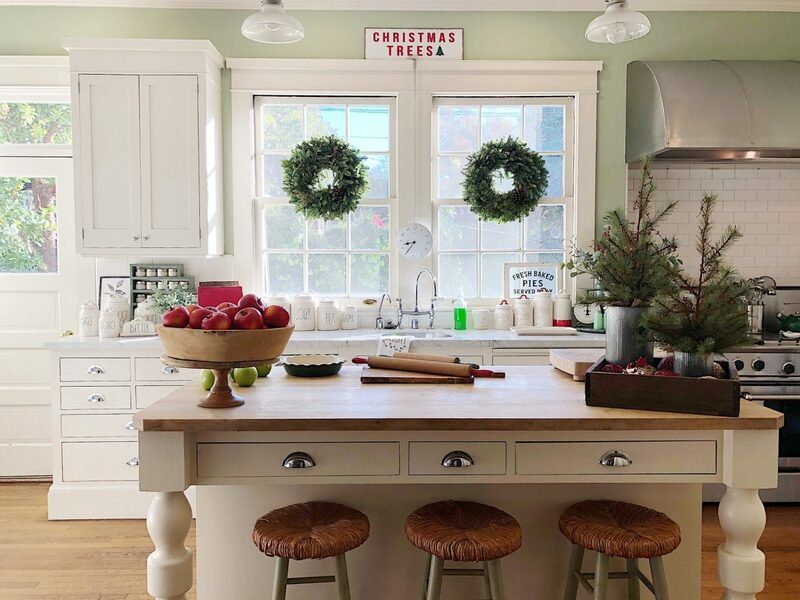 Your Christmas table and traditions are lovely and wonderful! I only have two more classes to complete my Master’s in Nursing! YaYYYYYY! The current class I started last week is the class where I will write my thesis. I just finished doing some research and decided to check my email and there was your email! 🙂 I loved it! I am drinking some chamomile tea and just winding down for the night. What a pretty table Leslie, beautifully done. 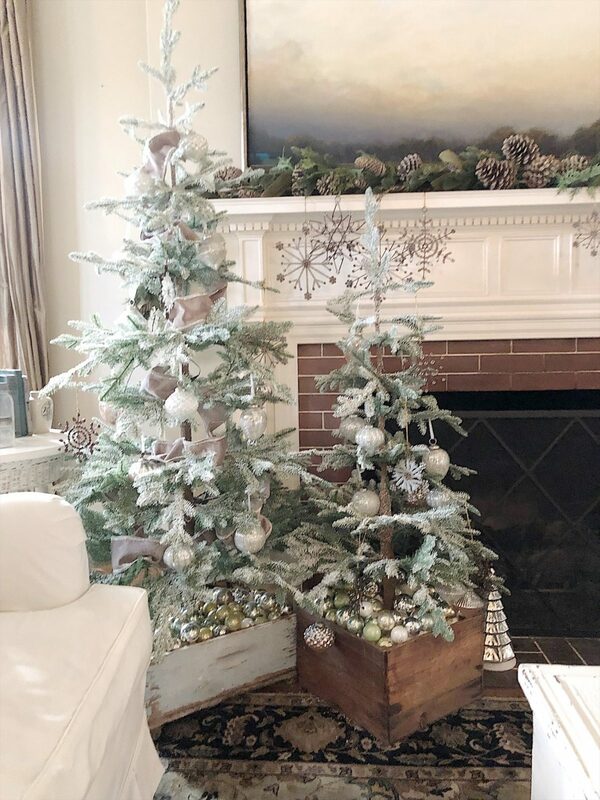 I just might start one or two or all of your Christmas traditions!! Love it, and beautiful table by the way!! I love your table Leslie. I know you enjoy cooking too. So in the “real world” where do you place your food? Do you serve your guests, have a side board, waitstaff? I know I have asked you about putting your tranferware in the dishwasher, but do you put these plates in the dishwasher too? Could you please post your Mothet’s recipe for her sausage casserole. Your table is stunning! I didn’t realize Spode had a gold Christmas series! I love!now I want it! Thanks for sharing, I think!